Located 430 miles south of Guam in the Western Pacific Ocean, is a small, coral atoll made up of 22 islands called Woleai. Part of the Federated States of Micronesia, the atoll’s inhabitants are isolated from the rest of the world with their only means of communication being a VHF radio. Woleai is a unique place in the world; everything on the atoll is communal and there are different clans, each with their own chief. Above each clan chief are three paramount chiefs that rule the island. While Woleai Atoll is a place many of us have never heard of, or will likely never visit in our lives, there are approximately 1,000 people who proudly call the atoll “home.” Petty Officer 2nd Class Kensley Raigeluw is one of these people. Raigeluw is currently stationed aboard Coast Guard Cutter Jarvis, a high-endurance cutter that routinely deploys to the Pacific – from Russia to Panama and everywhere in between. While the crew travels great distances, they were recently able to take a brief departure from their primary mission to reunite Raigeluw with his native soil. It was the first time Raigeluw visited home in 12 years. Petty Officer 2nd Class Kensley Raigeluw and his father Lorenzo reunite. U.S. Coast Guard photo by Petty Officer 2nd Class Joshua Tobosa. 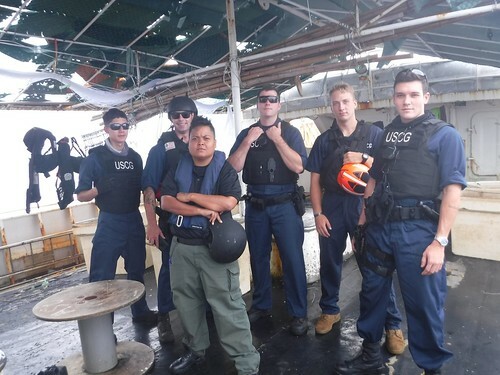 It’s hard to imagine a young boy growing up in such an isolated environment finding his way into the U.S. Coast Guard. But Raigeluw’s journey started with a chance encounter when he was just eight and Coast Guard Cutter Basswood came to the atoll. While more than a decade has passed since he has returned, he has strong memories growing up in Woleai, where people live off the land and ocean. Raigeluw left Woleai in 2000 to attend college in Pohnpei, Federated States of Micronesia, followed by the University of Hawaii in Hilo, Hawaii. He earned this opportunity by being one of two people from his island who achieved high enough scores on a college aptitude exam. Years later, in September 2005, Raigeluw was looking into joining the Army, but happened to see a Coast Guard banner online. It immediately reminded him of the Basswood and he made the decision to join the Coast Guard. After college he enlisted in the Coast Guard, attending boot camp in Cape May, New Jersey – 9,000 miles away from his native atoll. After graduating from boot camp, he was assigned to Station Rio Vista, Calif., and now Jarvis, bringing him back full circle to the place where he was born. Anchored offshore, Jarvis’ crew launched both their small boats loaded with donations of canned foods, medical supplies and gifts. When asked what emotions he felt being home after 12 years, with his crew besides him, Raigeluw could only recall one – happiness. “The day when my ship sailed to Woleai was one of the best days of my life. It is hard to explain how overwhelmed I was with happiness,” said Raigeluw. When word got out one of their own was there, the whole village came out to greet him. The visit lasted just hours as the cutter had to get back to the mission at hand. But before departing, Raigeluw presented a gift to his family – a photo album containing pictures of his wife and two sons, whom his parents have never met. While the visit was short lived, Raigeluw will hold onto the memory of his homecoming forever, adding the experience to his already unique perspectives from growing up on Woleai Atoll. While Raigeluw may have come from a far away place, who he is and what he stands for is something we can all identify with.